The Rokinon Diamond Black Reflector Telescope (767AZ1) has top-quality optics that produce sharp and remarkably clear and bright images which define this model. 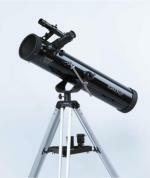 This telescope features a Newtonian optical design with coated mirror optics and a 20mm secondary mirror to enhance light gathering capabilities and contrast. The coated glass interchangeable 10mm/70X and 25mm/28X eyepieces provide for a wide choice of magnifications, and a 2X Barlow doubles the magnifications to 140x and 56x respectively. The 76mm front object diameter delivers superb light gathering power for outstanding astronomical views of star fields, clusters, bright galaxies, and the sun, moon and planets. Terrestrial images are also sharp and clear with minimal distortion and aberration. Additional features include a 6x24 finderscope that locates the object to observe, an alt-azimuth mount that has controls which point the telescope vertically and horizontally, and an adjustable heavy-duty aluminum anodized tripod with wall to wall accessory tray.